The UFC has become a major attraction recently, gaining more popularity as time has gone on. People just can’t seem to get enough of tough guys (and girls) going at each other. The fights feature a lot of tension, physicality, technique, and drama. The glory of victory, the passion even in defeat, and the satisfaction of seeing the fighter you back take the win is a real thrill. But there’s more to these UFC fighters than just what happens in the ring. The trash talking, gesturing, and fighting, and personality driven narratives outside the octagon can be a real treat to watch as well. That’s why we love every minute of the action. Of course, because of all the attention on and excitement around the sport, a lot of money flows into these fighters’ coffers. Josh Koscheck wasn’t just satisfied with any vehicle. No, he decided he needed one of the fastest and most expensive cars in the world: the Ferrari F430. And to top it off, he had it customized to his liking because a normal Ferrari wasn’t enough. When you have half a million dollars lying around, what kind of car do you get? Apparently, if your name is Conor McGregor you buy a Rolls Royce Ghost. Of course, you don’t just get any Rolls Royce Ghost. You need to get a custom emblem of your face with the words “notorious” splayed across the side. That way you can really roll in style. Conor picked this beauty up right before his fight with Eddie Alvarez for the lightweight title. It might have been on purpose as a sort of ego boost. McGregor even admitted to having a problem with spending money, funny enough. But he seems to be earning enough of it to pay for his exploits, so it evens out in the end. But we’re done checkout out Conor’s rides just yet. He also cruises around in a BMW 18. After all, how else are you supposed to show up to your court date for a speeding ticket? Especially if you didn’t show up to the first one? If you’re Conor McGregor the answer is that you put your green track suit on, hop in your BMW and head over to the court. A little side note on the hearing: he was fined about $500 and was even offered two months and a payment plan to take care of it, which prompted a lot of laughter from the courtroom. Yandiev has one of the coolest cars in the game. His Lamborghini Murcielago has been the showcase of many car blogs. His mechanic is a 43 year old man from his home country. He has repaired the car back to its original form. In Russia, a lamborghini is one of the most prized possessions you can own to showcase your wealth Yandiev is no stranger to this, growing up in Moscow. He constantly saw fancy cars growing up and was waiting for the moment when he had the chance to pick up one of his own. You would be hard pressed to listen to a modern rap album without hearing the word “Maserati” at least once. And there’s good reason for it too. The Maserati is one of the most expensive cars on the planet. With elite speed, acceleration, and handling, it’s a super car for the ultra rich. Apparently, Silva wanted to show the world that he belongs to this class. After he knocked out Alistair Overeem. He wanted to recognize his accomplishment, and have other recognize it too. Therefore, he went to Sienna Motors who are his sponsors and told them he wanted this car on top of his 50k bonus he received. If you’re the kind of guy who likes trucks, then nothing beats a solid one. All the sports cars in the world don’t compare to the power, the masculinity, and the size. That’s what Miocic was thinking when he got his Dodge Ram Rebel. This car has ventilated seats, with an all black exterior. Sure, it gets hot. However, the fun of driving it more than makes up for it, according to Miocic. What’s more classic than a 1971 Ford Torino Cobra? Apparently, not much. Cain drives this car at least one per week. It doesn’t matter what he’s doing, whether it’s shopping, taking joy rides, or just running errands. He is often spotted cruising in his Ford by pedestrians. The story behind his interest in Ford cars? His family had a lot of them growing up. He knew he wanted a classic vehicle when he finally had the money. He says it’s his dream car. And you have to admit, a classic American muscle car is a pretty good fit for a fighter like Cain. If you see Dominick Cruz around his native area of San Diego, you have a good chance of seeing him sporting his new Nissan GT-R. 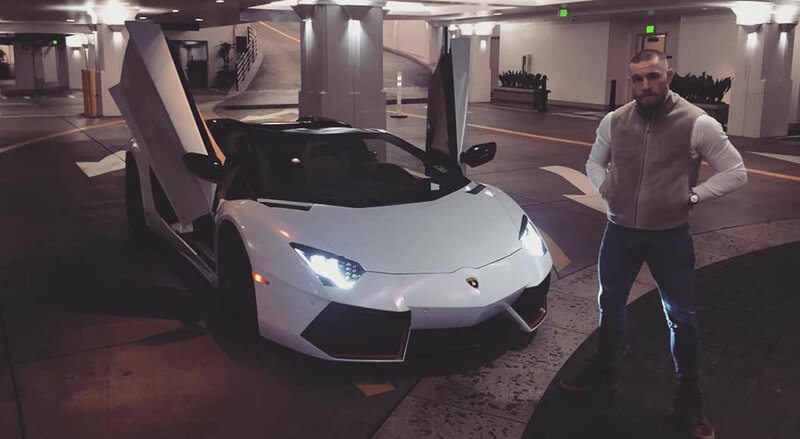 This car is special for him due to it being a bonus he got when he won the UFC title against Demetrious Johnson. To him, this is more than a car. It’s a trophy, validation that he is the best at what he does. The reason he got the Nissan instead of other, more flashy cars like Lambos, is because the Nissan is designed to be a performance car. It can drive well without just looking good. It’s the best of both worlds. Anthony Pettis has had a meteoric rise in the UFC. He has beaten multiple champions to claim his spot in UFC infamy. However, he is also known as a car man. Pettis loves his Dodge Charger, which is completely unique. He sent it to a body shop in lA who refitted everything, including the body, suspension, wheels and a sound system. After 8 weeks, he finally had his dream car. Randy Couture’s Chevy is a classic from 1949. This UFC mega star said he didn’t want to worry about having real power under the hood. That’s why his car proves he’s a real man and he can roll with the most classic of guys. The metallic paint he had put on shows that he has style too. He even had the original grille replaced. The car is a perfect example of what can happen when brains and brawn are put together in one, strong, metallic package. The grille is from 1949 and is still in original condition. If there is one hobby that matches up perfectly with the high flying, high testosterone, high tension sport of UFC fighting, it’s car collecting. As these UFC fighters have shown, they agree. And they have spared no expense in ensuring their personal super cars showcase their success and their personalities. So next time you see one of these cars in your neighborhood, look at the driver behind the wheel and you might catch a glimpse of UFC royalty.